When the FBI first bought its own planes in the 1970s it was a minor scandal. But what’s so shocking about the feds having aircraft? The scandal was that they were originally experimental spy planes used in the Vietnam War. The FBI has finally admitted to using fake aircraft companies to fly surveillance missions over US soil. This isn’t terribly surprising news, since the FBI has been doing this sort of thing for years. But the FBI didn’t always have its own air force. 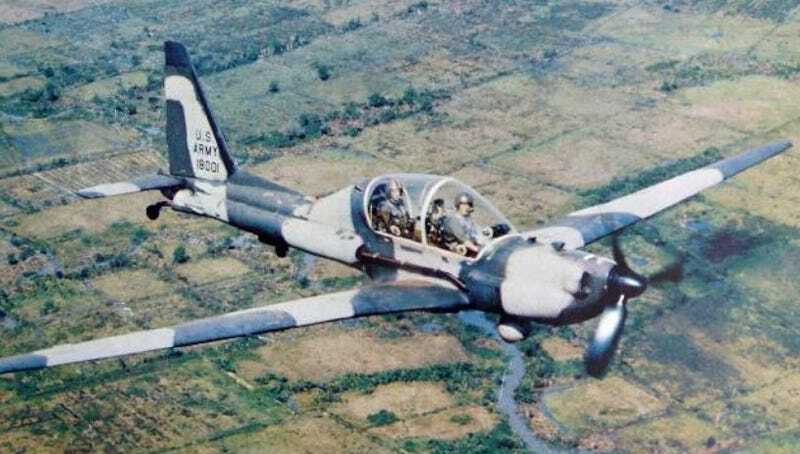 The FBI acquired its first two planes from the US Army sometime in mid or late 1974 and stationed them in Los Angeles. Both planes were Lockheed YO-3As, designed with a decidedly retro body (think more glider than supersonic jet) that allowed them to quietly patrol the skies over Vietnam. The YO-3A was notable in that it never took a single bullet from enemy fire, due in large part to the fact that it was virtually silent. But it wasn’t just their stealthiness that made the planes interesting to the FBI. They also had night-vision capabilities, a new technology that had been developed by DARPA during the Vietnam War. The YO-3A was also notable for being the first plane to feature the lasers that would later be used for guided missile systems. Naturally, news of the FBI buying up surplus spy planes from the Army didn’t sit too well with many Americans. Even if one gave the FBI the benefit of the doubt, the general impression from a public relations perspective was bad. Planes coming home from an unpopular war overseas to be used to track Americans? Even if they were being used exclusively for hunting down criminals, it wasn’t a good look. The fact that the FBI was acquiring its own planes at all worried some in Congress, no matter the source. Until the mid-70s the FBI always borrowed the helicopters and airplanes of other agencies whenever it really needed them. So why did the FBI want its own planes? The stated goal was to use these aircraft for trailing kidnappers and other aerial reconnaissance in Southern California. The same FBI agent assured reporters in 1975 that these planes wouldn’t be used for transporting government employees or anything shady like that. They were simply for “investigative purposes.” These days government employees getting free rides in expensive planes would no doubt be a lesser scandal than surveillance planes stalking American skies.